Why Choose EAST WEST MEDICAL ARTS? Because KNOWLEDGE + EXPERIENCE = RESULTS! Our focus is always on YOU and helping you achieve YOUR Health Goals. We Offer Symptomatic Short Term Treatment for Acute Conditions, and Long Term Treatment for Chronic Conditions. We Have Been Serving the Primary Health Care Needs of individuals and Families in New Mexico for over Thirty Years. We Welcome New Patients, Both Residents and Visitors to The Land of Enchantment. Our clinic is conveniently located near the center of Santa Fe and Christus St. Vincent Hospital. BOOK YOUR FREE 30 minute CONSULTATION TODAY! CLICK THE SCHEDULE ONLINE button, or CALL 575-737-8727. Dr. John D. Ross, National Board Certified (NCCAOM), Doctor of Oriental Medicine (NM), Acupuncture Physician (FL), NREMT-P. East West Medical Arts specializes in the treatment of “Difficult and Unusual Conditions” which have not responded to standard care, either Western or Complementary. 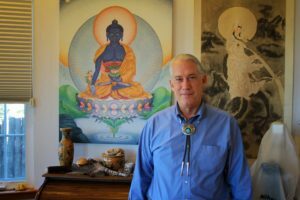 Best Advanced Practice Acupuncture In Santa Fe, NM – Asian, Functional, and Longevity Medicine. Ancient Wisdom + Modern Medical Care = The Most Powerful Medicine on the Planet. This combination of modern science and ancient wisdom creates the most powerful medicine on the planet. We are your Expert Medical Detectives. Using a combination of Modern and Traditional Diagnostic and Treatment techniques, individualized programs are established for each patient. What this means Is THE FASTEST POSSIBLE NATURAL RESOLUTION TO YOUR HEALTH PROBLEMS. Just click the SCHEDULE ONLINE button, and begin your path along the way to Health, Wellness, and Longevity with a phone or online Video Consultation! Learn how the best in health care can assist with your health issues by booking a FREE 30 minute Phone or Video Consultation. Click the Schedule Online button on the right to schedule your Phone or Video consultation today. Your FREE thirty minute Screening Session will introduce you to how the world of Modern Acupuncture and Evidence Based Integrated Medicine can help with YOUR Health Concerns. PILGRIM, ARE YOU : FAT? FATIGUED? DEPRESSED? DO YOU HAVE GI (stomach and digestion) ISSUES, or HORMONAL IMBALANCES? WE HAVE SAFE, EFFECTIVE, NATURAL TREATMENTS FOR THESE, AND MANY OTHER MEDICAL CONDITIONS. Are You In Pain? Do You Want To Make It Go Away? Your Body Will Tell You When Something Is Wrong – Listen To It, And Then Come To My Clinic. We Will Use the combination of the Best of East and West to Find And Treat The Cause Of Your Dis-ease and Pain. Evidence-Based Integrated Medicine may hold the Solution to Health Issues which are not easily identifiable or treatable by other means. Do You Want the best of both Ancient and Modern medical care, and a blending of Eastern and Western Medical Traditions? WE ARE THE ADVANCED EXPERTS IN INTEGRATIVE MEDICINE. SAFE, EFFECTIVE, NATURAL, EVIDENCE – BASED, MULTI – MODAL MEDICINE. Click the Schedule Online button on the right to schedule your Phone or Video consultation today. Your FREE thirty minute Screening Session will introduce you to how the world of Modern Acupuncture and Evidence Based Integrated Medicine can help with YOUR Health Concerns. We look forward to being of service to you soon!